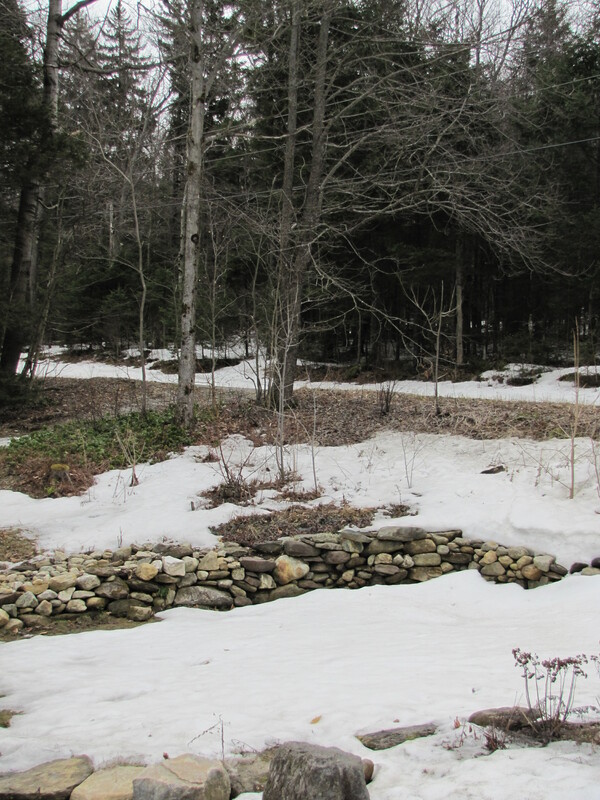 I must be the only person in Vermont who is happy to still have snow in April. It has provided me with the best possible backdrop for selecting coloured glass. The window is almost cut, and the snow, right on cue, has almost disappeared. … and the window, taken as it was getting dark. I will post a better photo in a day or so when it’s totally finished. Then I’ll be moving into the glasspainting stage. But before I do I’d like to recommend a couple of books and sites about colour. 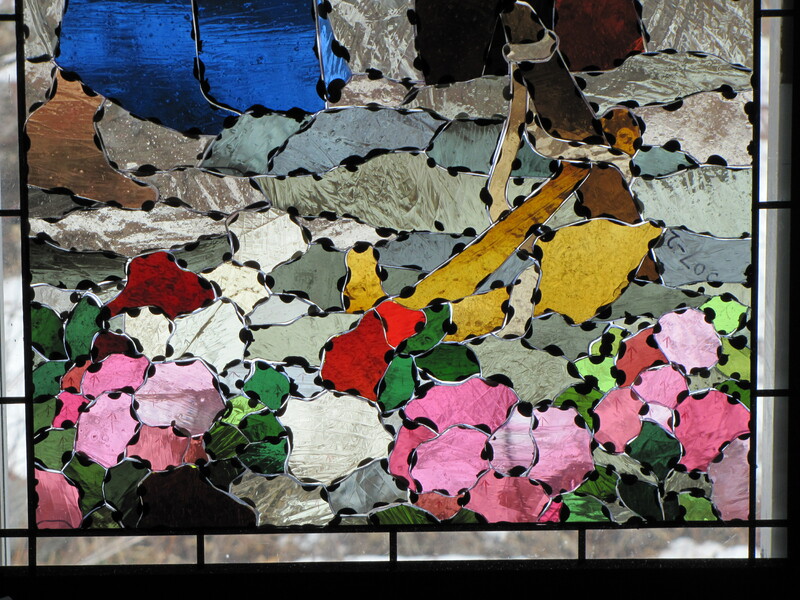 Understanding colour is pretty crucial because a stained glass window is basically a huge collage – a combination of pre-determined individual colours. It’s not like mixing paint from tubes where there are numberless options available. To complicate things, every time you add a new piece of glass it affects all those around it. It’s not practical to keep changing your mind (though I do this far more often than I’d like), but on the other hand, I really do want the window to read as a unified scene. I know only too well the limitations of the medium. 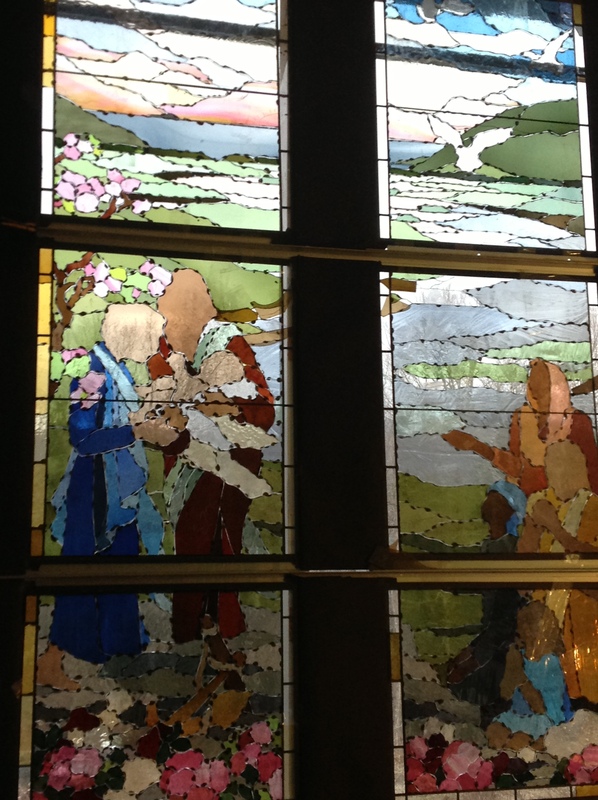 As I’m choosing glass I am constantly imagining how the window will look when it’s painted. I stay mindful of the fact that I can make colours appear darker with paint, but I cannot change the hue (the actual colour), the saturation/intensity (how clean or muted it is), or make the glass look lighter. And then there’s that annoying tendency for adjacent colours tend to interfere with one another, sometimes quite a lot. I remember what an eye opener it was to learn about colour in art school. One memorable exercise from my first year at Edinburgh College of Art was painting a still life (objects on a table) all in the same tone/value. Imagine, the red apple had to be painted pink, and the grapefruit, mustard-coloured. If you screwed up your eyes and looked through your eyelashes your painting was supposed to look coloured but without definition between different objects. It was quite a challenge, but wonderful training. Music provides a good analogy for colour: some people are tone deaf, a few have perfect pitch, most are somewhere in between. It’s the same with colour. Some can perceive fine and subtle differences between colours, some cannot, and some people are colour blind. In both cases we can learn how to perceive or reproduce notes and colours more accurately through training. I found this brief, neat explanation of colour theory and descriptions of some of the exercises we learned in the stained glass department at Swansea College of Art, like contrast and dominance, and figure-ground relationships. I read the famous books, “Interaction of Color” by Josef Albers and “Elements of Colour” by Johannes Itten from cover to cover, and remember how exciting it was to perceive coloured after-images for the first time. If you’re not familiar with Itten’s theories you can read more here.